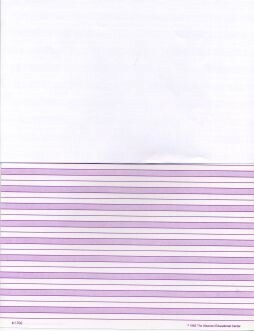 FOR CURSIVE WRITING This shaded and ruled paper is particularly suitable for junior elementary students while they still are in the sensitive period for learning to write in cursive. The shaded area indicates where the main body of each letter is to be placed. Short compositions of real or imaginary subjects can be the product of creative writing or dictation. The blank half page allows space for the child to draw a picture. This paper is sold in reams of 500.